You know why no one wants to talk about cancer? Because everyone assumes they have little to no control over whether or not they’ll get it. Well here’s some good news for the new year: 90% of all cancer is related to lifestyle choices! So the best way to deal with cancer is to prevent it in the first place. It all comes down to what we put into our bodies. Either we provide our body with high-octane fuel to support function or we feed it substances that impair the body’s ability to destroy cancer cells. Drugs, junk food, hormones, chemicals, these all contribute to an environment conducive to cancer. Starting today, small lifestyle changes can dramatically improve your chances of living a cancer-free life. And if you want to clean up the residue of bad choices in the past, our Detoxification Program – targeting the liver, kidneys, lungs, fat tissue, blood, skin, and muscles – can produce truly amazing results. The start of a new year—what a great time to give your body a new start. Happy New Year to every inch of you! Stored toxins we’ve picked up due to the environment/diet/bad habits circulate in the blood and can contribute to long-term poor health. 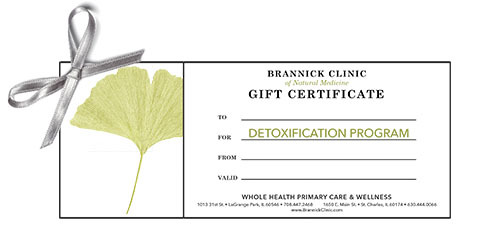 Detoxification is the process of removing toxins from the body through a number of therapies as needed for the individual—Peat Baths, Infrared Sauna, Constitutional Hydrotherapy, Colon Hydrotherapy, Fiber and Herbal Therapies. Drop in to one of our clinics to get more information. Or call or email and we’ll gladly explain more about the program. Copyright © 2019 Brannick Clinic of Natural Medicine, All rights reserved.